Since I first used Dream Wool batting by Quilters Dream back in June for my B.U.B. quilt, wool batting has become my first choice. I love the airy softness, the gentle drape, the coziness, and the loft that makes quilting pop. Naturally all this comes at a higher price than cotton, polyester, or cotton/poly blends. With the higher price point, saving up scraps of wool batting is a no brainer. 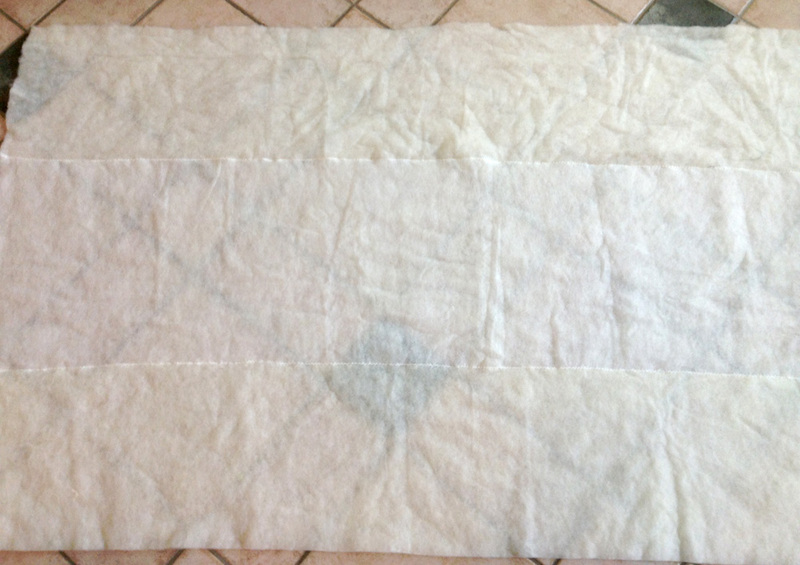 I regularly machine piece cotton batting scraps together for quilts using a wide zigzag stitch (here's a quick tutorial for that), but I was unsure that piecing wool batting would be as straightforward. I went ahead and tried my normal approach: a zigzag stitch with the widest setting and a length of about 1.8 (my Juki's length ranges from 0-5). It was no good. Wool lacks the density of cotton and is prone to stretching. My seam was wavier than the ocean in a hurricane and it would not lay flat. The seam also felt too noticeable to the touch. Next, I tried whip stitching pieces together by hand, but my attempts seemed both structurally weak and left an obvious pucker. Plus, it's slow. Moving on. Lastly I considered fusible batting tape. I use this stuff for Soft & Stable scraps, but I felt that it would feel too noticeable in my quilt. Additionally, the care information for Dream Wool says not to iron it, so I ruled this out. Determined not to let my scraps go to waste, I tried the the logical path my brain whispered to me. I laid out my scraps with the edges butting up against each other. Using large basting pins, I pinned the pieces together every 10" or so. I was careful to keep the pins perpendicular to the seam so I could be sure the pieces would be fed through my machine evenly. On my machine, I switched from a walking foot to a standard presser foot. The walking foot's grippy feet seemed to be getting tangled in the fibers of wool and causing it to feed at an uneven rate. The irony. I also lowered the presser foot pressure as low as it can go. I also made some adjustments to my stitch length. I did some tests on scraps, lengthening the stitch length until the seam didn't feel so prominent. I ended up using a length of 4.2. 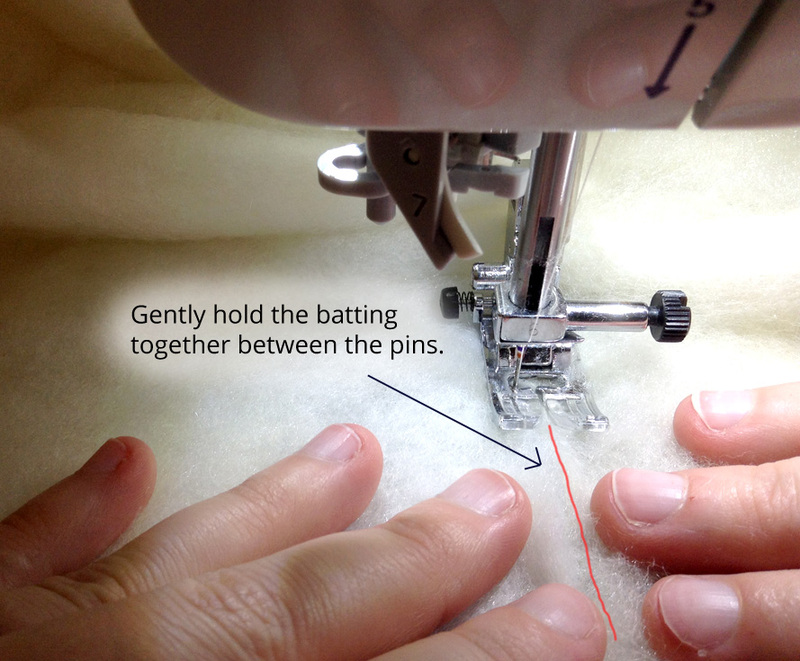 When sewing my scraps, I kept a hand gently placed on each piece of batting close to the seam and sewed very slowly. 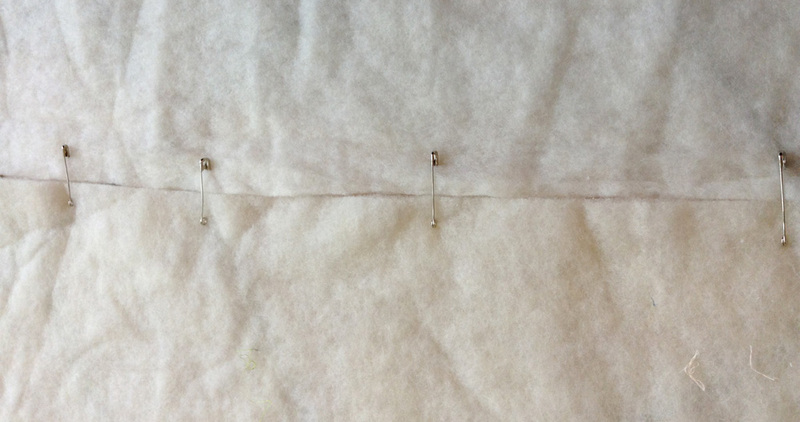 As I progressed, I paid close attention to upcoming pins, making sure they stayed perpendicular to the seam. If they're crooked, you've got an obvious sign that your batting hasn't been feeding evenly. I removed the pins just before they reached the presser foot. All the while, I gently held the batting pieces together near the seam. Occasionally a few fibers would get snagged on the front of the presser foot which would cause some feeding unevenness. 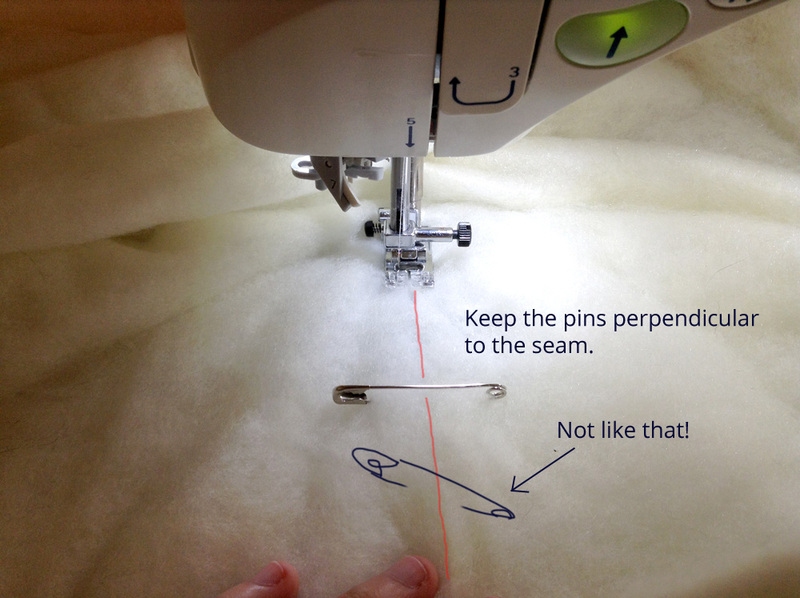 In those instances, I stopped sewing, un-snagged them, and continued on. The end result was pretty good! There were a tiny small waves here and there, mostly where I started sewing too fast or had fiber snags that weren't corrected quickly. But overall, my pieced batting was acceptable and was easily smoothed out in the basting process. So there you have it! If something doesn't go right the first time, MAKE IT WORK.